Custom install solutions allor for permanent multipurpose rack set up on difficult to fit application including sheet metal roofs camper shells. 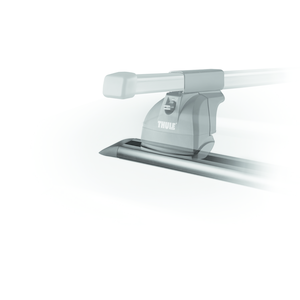 Thule's Top-Tracks system mounts permanently to the roofs of SUVs, camper shells and mini vans to create an adjustable and stylish platform for multipurpose rooftracks. Custom look with multi-sport function. Tracks allow infinite foot positioning for load carrying flexibility. Heavy-duty, black anodized aluminum track is corrosion resistant. Integrated PVC seal on Flare-Nut reduces number of installation parts and provides a weather resistant seal. Two lengths available for Flare-Nut applications, 42" and 54".